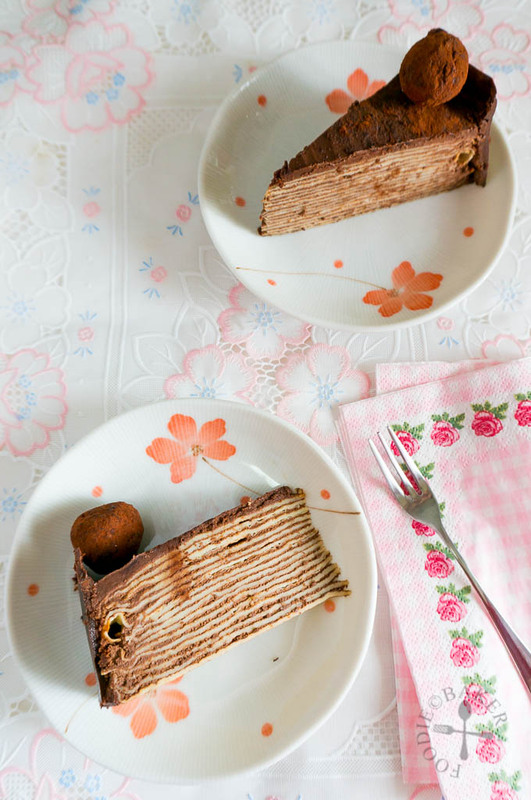 Crêpe cake has been something on my to-make list for a very, very long time – the seemingly tons of layers look so attractive and I’ve always wondered how it tastes like. So when my friend’s birthday drew near, I decided to give it a try! Given the fact that I have only one chance to get it right (I didn’t have time for a trial), I searched high and low looking for recipes. Eventually I settled for the one by Sprinkle Bakes, purely because hers look so pretty and the chocolate components sound too delicious to resist! 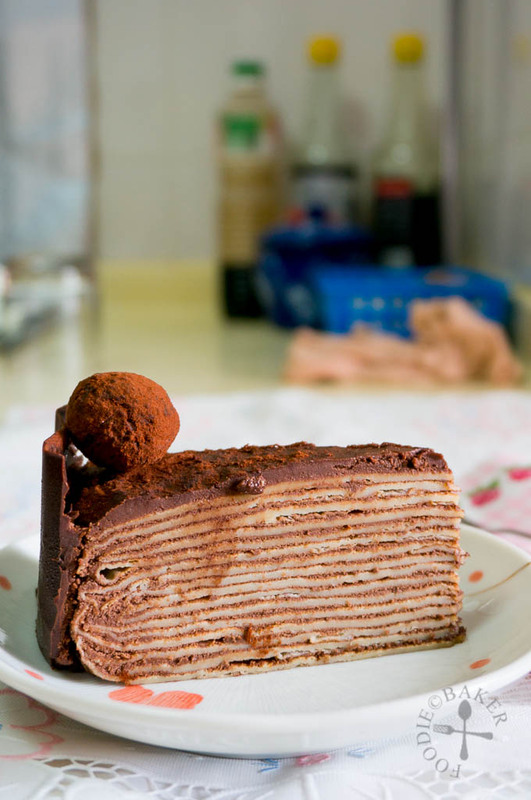 The crêpe cake is definitely a time-consuming cake, perhaps as time-consuming as making kueh lapis! It looks really impressive and stunning, with 17 crêpes stacked on top one another, each filled with a little ganache and chocolate whipped cream – it is definitely the cake to go for to impress family and friends! In terms of taste wise, it’s a lot lighter than the usual layered cakes, some of my friends preferred the usual layered cakes while some of them like the crêpe cake because it’s a lot lighter, great to have it as a dessert after a heavy meal. So will I make it again? I most probably will attempt another flavour, but not so soon… perhaps when another friend’s birthday draws near! Crepes: 1) Sift the dry ingredients and make a well. 2) Add in beaten eggs. 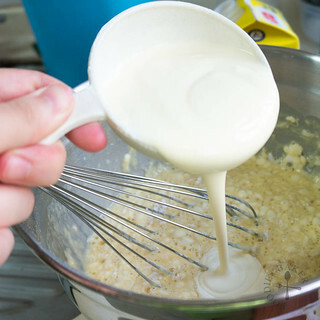 5) Whisk and strain to get a smooth batter. 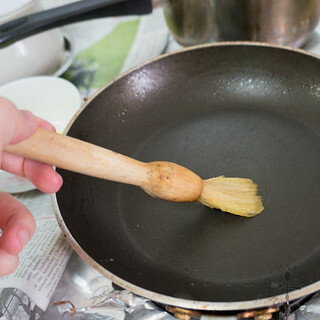 6) Butter a non-stick frying pan. 7) Pour a thin layer of batter and fry until golden. 8) Stack the crêpes and let cool. 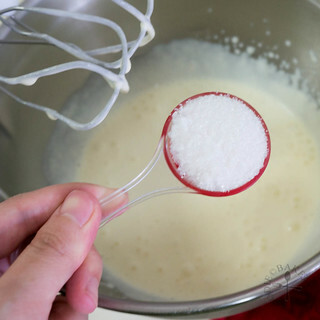 Filling: 1) Whisk cream with sugar. 2) Sift in cocoa powder. 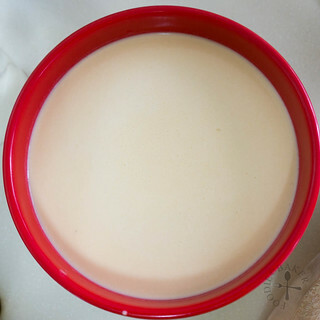 3) Stir in Kahlua. 4) Keep chilled until ready to use. Ganache: 1) Chop the chocolate. 2) Pour in the hot cream. Assembly: 1) Spread a little ganache. 2) And some chocolate filling. This post is for Little Thumbs Up (August 2014 Event: Flour) – organised by Zoe (Bake for Happy Kids) and Mui Mui (My Little Favourite DIY) and hosted by Diana from the Domestic Goddess Wannabe. 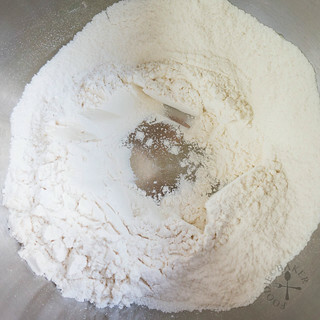 Sift flour, salt and sugar into a large bowl and make a well in the middle. 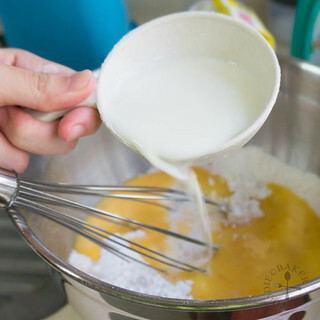 Whisk in the eggs, cream and vanilla. Whisk in milk until you get the consistency of heavy cream (I used the whole cup of milk). Strain over a sieve into a clean bowl for a lump-free mixture. Heat an 8-inch non-stick frying pan over medium-heat. Brush with melted butter - the butter should be sizzling. 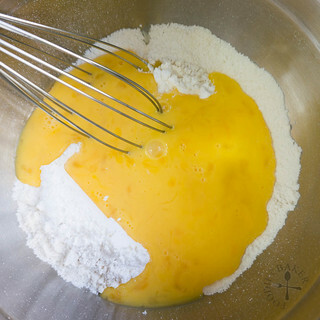 Stir the batter and scoop a scant ¼-cup batter. Hold the frying pan with your power hand (right hand if you are right-handed) and the scoop of batter with the other. Pour the batter in the middle of pan, swirling the pan as you pour so that the batter coats all around the pan. Cook for 2 to 3 minutes until the crêpe is lightly golden-brown at the bottom. Slide the crêpe out onto a large plate. Repeat the process until all the batter has been used up. You will end up with 20 to 25 crêpes (some of which might not be usable if this is your first time making it, but it's okay). This will take about 1 hour. Let the crêpes cool completely before assembly. Place the chilled whipping cream in a very chilled bowl. If working in a warm kitchen, set the bowl over another bowl of ice water. 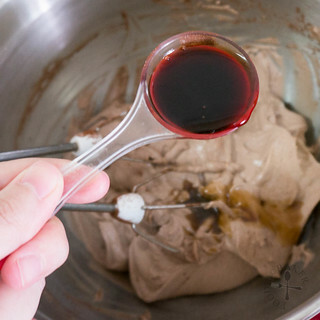 Using an electric mixer, whip until soft peaks form. 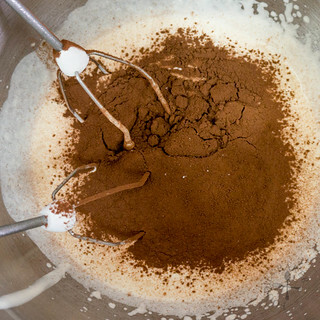 Add in sugar, Kahlua and sift in cocoa powder. Whip until stiff peaks formed. Keep it refrigerated until needed. 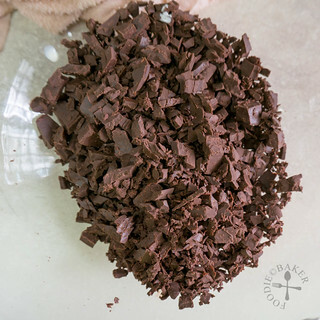 Chop chocolate into very small pieces. Place them in a large heatproof bowl. Heat the cream until simmering then pour it over the chopped chocolate. 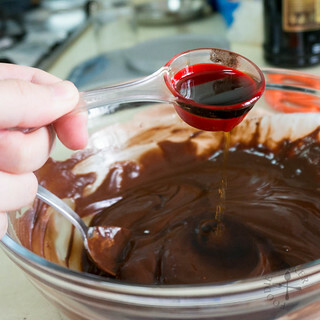 Set aside for 5 minutes then stir until all the chocolate has melted and the mixture is smooth. Stir in the Kahlua. Let cool to room temperature before using. Dab a little filling on a serving plate. 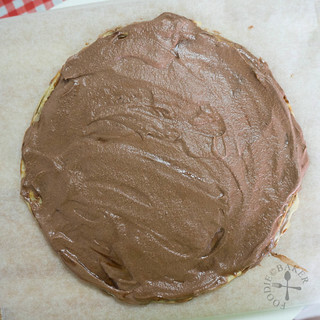 Place a crêpe in the center. 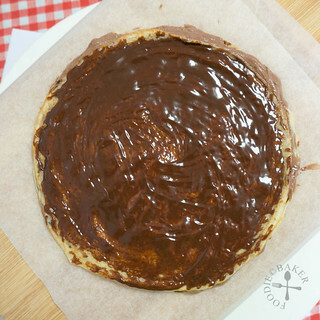 Spread a very thin layer of ganache over the crêpe with the back of a spoon, just enough to cover the crêpe. Spread a little filling over the crêpe. 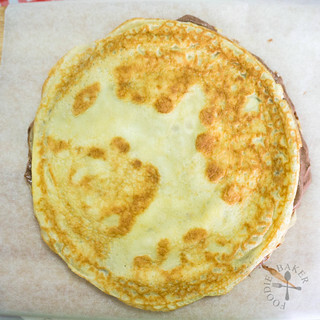 Place a crêpe on top. Repeat until all the filling has been used up. Frost the cake with the ganache. Chill the cake for at least 1 hour. To make the chocolate collar: Cut a strip of parchment paper long enough to go around the cake. The height of the strip should be about ¼-inch taller than the cake. Spread a thick layer of the melted chocolate on top and set aside for 15 to 20 minutes, until the chocolate is starting to set. Lift up the collar and wrap it around the cake, snipping off the excess. Refrigerate the cake for 30 minutes. Gently peel away the parchment paper. Dab the bottom of the truffles (if any) with a little melted chocolate and "glue" to the top of the cake to decorate. Do plan ahead as the crêpes take about 2 hours from start to finish and most of the time you can’t be away and doing something else. The assembly will also take quite some time, especially if you are working in a warm kitchen, you will want to work in batches so that the crêpe cake stay in shape. 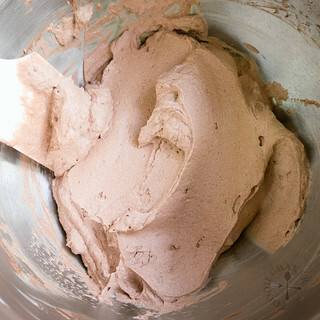 Always give the batter a stir before you scoop the 1/4-cup of batter for cooking. I don’t have a crêpe pan, so I make the crêpes in my non-stick frying pan. 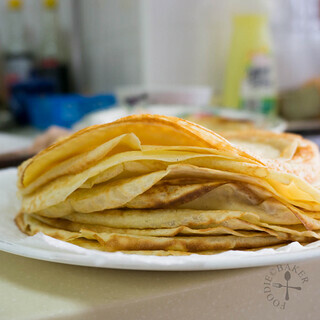 You might experience some difficulties if you are new to crêpe-making – my first few crêpes were a failure, but you will get the hang of it after a while. Brush the pan with butter before pouring in the batter. Occasionally, wipe clean the pan before brushing the butter. Butter burns so you won’t want your crêpe to have the burnt taste. 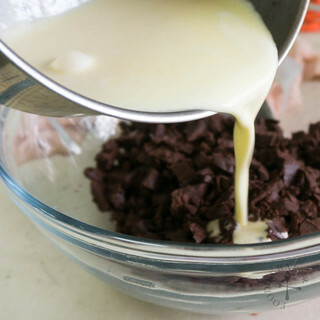 The crêpe sets the moment you add it into the pan, so you will want to swirl the pan as you add the batter so that you get the crêpe as even as possible. If the crêpe is not even, when you assemble them, you will realise the middle of the cake will be higher than the rest and the cake may slide around. 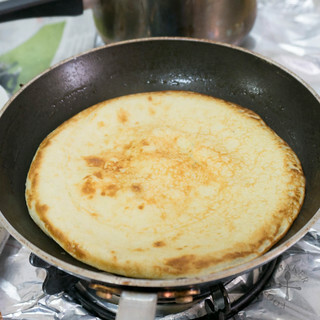 It is okay if the crêpe comes up to the sides of the pan, it will flatten when you assemble them. This amount of filling is only able to fill lightly 17 to 18 crêpes. If you want a thicker filling, do increase the amount proportionately. 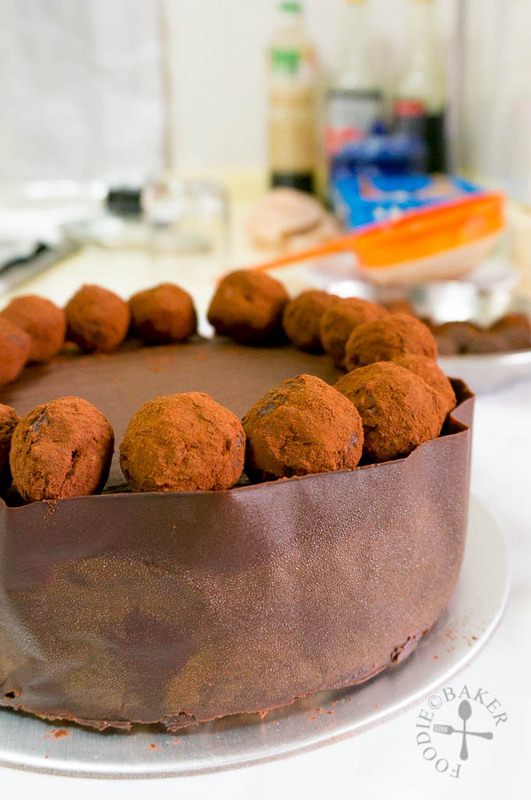 You will have ganache leftover after you frost the cake, which can be rolled into truffles. Given Singapore’s very warm weather, I found that my filling kept threatening to melt and that the crêpes are at a risk of sliding off. So after every 5 layers, I will freeze the cake for 15 to 20 minutes before continuing to assemble it again. So if you face the same problem, do freeze the cake once in a while to help firm up the cake. I made the chocolate collar because I was bringing the cake out and was worried that the warm weather will cause the filling to melt and the crêpes to slide, so the chocolate collar helped to keep the cake in place. If you are serving it directly from your refrigerator, feel free to omit the chocolate collar. After using up the filling, I refrigerated the cake for an hour before frosting it with the ganache. Your cake is beautiful. Every layer is perfection. Crepe cake will be on my list! 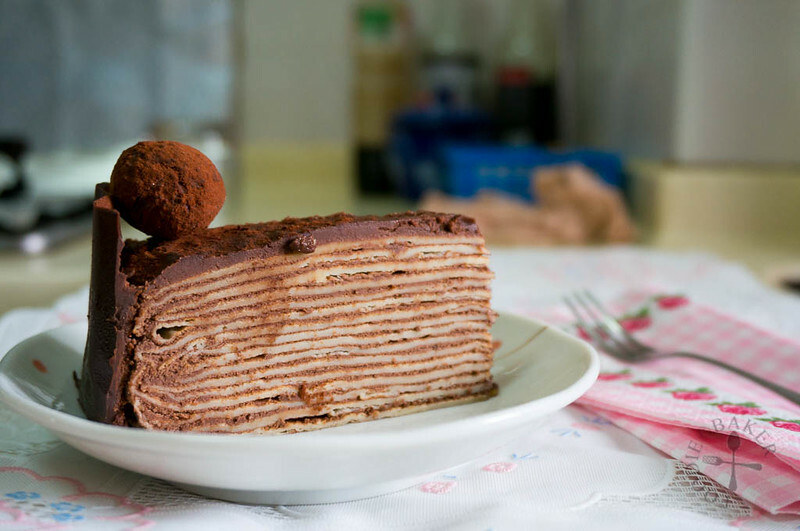 I have always wanted to try to make a crepe cake. This looks GORGEOUS!! Thank you Cathleen! It’s not as difficult as it seems, hope you’ll have a chance to make them soon! Hi, what cream did you use for the crepes? WOAH!!! This is so so so beautiful!!! Your cake is so pretty… Every layer is so neatly stacked. 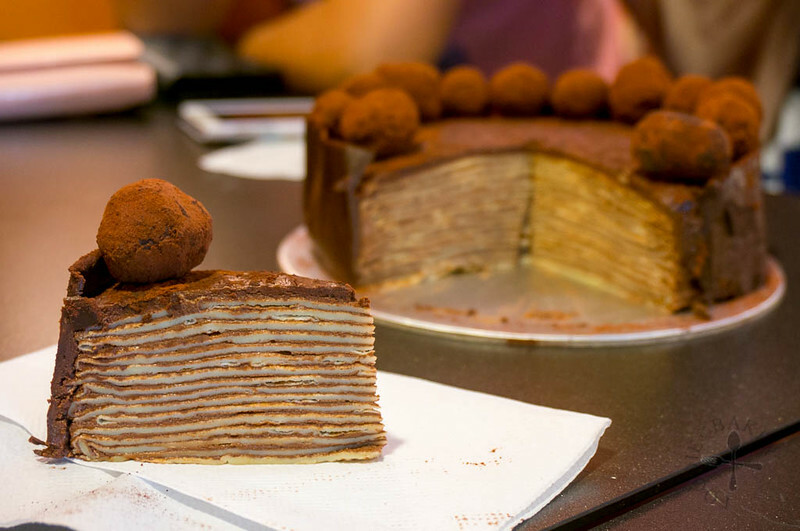 I’m not a crepe lover, but yours look pretty stunning and delicious.especially the yummylicious truffle…. Slurrppp!